Religious ascetics always compared human Mind with the Eye and this is one of the most widely spread Christian comparisons. Mind is the organ of spiritual vision and the supreme Eye. if a person’s soul has been enlightened in joining the Most High, his face becomes the Eye. He who had the Eye also possessed complete spiritual vision, and “seeing” meant “knowing”. in ancient times a few, only the chosen ones, did possess absolute spiritual vision, which was granted from above. it was the principal treasure a man could possess because of its divine nature. Gor’s Eye in ancient Egypt, Buddha’s All-seeing Eye in ancient India, and Christian savior of the Fiery Eye and others have become the symbols of long gone civilizations and cultures. These notions have been incarnated as the unique masterpieces of the world culture. Visual images were traditionally considered the most powerful tools to influence people and were successfully employed by most world religions to transform inner spiritual life of a person. Thus, sainthood considerably enhanced the praying call of believers addressing them. Images added emotional color and enriched religious experience. Spiritual vision is a unique sacrament; Nowadays it is concealed from most of human race and people have lost this special Eye-Vision. A modern person lives with echos and fragments of transcendental gnostic knowledge. But only spiritual vision can combine fragmentary impressions of the world and human being, and help become a part of the Universe. Gregory palama, the founder of psychasm, who had a great impact on the works of A. Rublev, called this sense “super-rational Eye of Unity”. Great icon-painting masters and artists were granted spiritual contemplation and were able to embody this God’s gift in their works. However, only a few artists of the past and today really possess this talent. The artist is able to breathe life into them. Then they get a second wind becoming the foundation, a “canvas” for the image. The images of the savior, the Blessed Virgin, saints, Holiday icons are not a mere stylization of antique, are not “icon-like” products, but independent and individually sensible images in artistic works. What is this? is this the secret of the slavic soul? is this the artist’s fancy? Or is it pragmatic calculation and economizing on new materials? The answer is — No. A. Tikhomirov admits: “Wood is a sheet, a canvas covered by God’s idea. The wood itself was created by God, whereas the artist’s task is to apply several accurate strokes to reveal the Creator’s image. The artist is to slightly open the mystery of creation and join it”. Tikhomirov has performed a spiritual exploit by healing the time that was out of joint. such an asceticism requires extreme spiritual and physical efforts. not every, even the most talented, artist is capable of this. spiritual nature is multi-leveled and polysemantic but every master reaches his height of work and limits of spiritual penetration. The height of spiritual comprehension of the world is achieved not only by high qualification and skills. They can serve the conditions but not a final goal in arts. The main thing is not to become proficient in a technology (though it is important, no doubts of it), but more important is the content of the artist’s work, conveyed thoughts and feelings, and the degree of virtue the artist could express and render using available tools. The artist jokingly speaks about serious things: “Soul is like Customs. You can carry one thing, but fail to carry some other stuff through it”. Only he who listens to his inner world, delicate spiritual experiences, who can value the perishable and the Eternal has the right to reason like that. The artist’s statements contain creative maturity and human wisdom, knowledge of his own destiny and discovery of the individual way in art. This is what a lot of people dream of, but not every one manages to achieve. Some friend of A. Tikhomirov made a good remark: “He is singing solo in art”, moreover, he is extremely “persistent, hard-working, he is a man of integrity”. As a reward there are personal exhibitions held abroad and in big cities, recognition, attention paid to his works by old friends and teachers, and by numerous new admirers of his talent. It is easy to understand the aspiration of the artist to be free from the rules of canon, to yield to creative imagination and become totally free. However, the theme of his works obliges and demands self-denial, neglecting personal ambitions, strict judging of himself and his works. I remember several lines by N. V. Gogol from his “Extracts of Correspondence with Friends”, where Gogol, discussing A. A. Ivanov, the author of “Appearance of Christ before the people”, wrote of the necessity of a “prayerful effort”, which is nothing but gaining the Holy spirit in art. He also talked about the difficulties on the path of a true artist, who took the liberty of working with this theme, which is like the exploit of a monk. N. V. Gogol himself had to experience rises and falls, difficulties and temptations encountered by any ascetic artist. nevertheless, being deeply faithful he understood that there was no other way to go up a single step leading to Heaven. Tikhomirov’s art teaches and sometimes makes the audience think, turn their eyes from vain reality to eternal values — Virtue, Harmony, and Love. it attunes to a deeper analysis of oneself in this world, adjusting and joining the spiritual activity. Visiting A. Tikhomirov’s exhibition is justly compared to visiting a temple. people notice that his works diffuse warmth and light. so was written in the guest book of Tvorchestvo Exhibition Hall in Taganskaya street here the artist’s personal exhibition was held in winter. Spectators feel conciliation and peace when they look at the works executed in fresco style: “Christmas” (49×28, 1999), “Baptism” (65×39.5,1999), “Michael the Archangel” (59×30.5, 1998) and others. Tikhomirov’s works have a clear, distinctly identified individual position of the artist and it seems as if it has been achieved through suffering: it is necessary to join and continue the spiritual and cultural tradition of ancestors, to gain a stable historical background. The artist has been stunned with what he has seen and discovered, and he is eager to share his discovery with others. 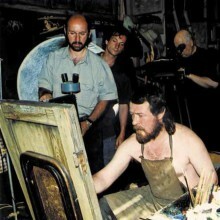 There are series of canonical works (in terms of scene and techniques) such as “Holy Trinity”, “Triptych and Festival of the Savior”, “Madonna with infant”, “Sergy Radonezhsky” and others. some works amaze its audience demonstrating that the artist was longing to surpass the limits of canonically stipulated iconographic scenes and types (for instance, “One who saw Me, sees You”, “Human Birth”, “Jonah in the Belly of the Whale”, “Annunciation Eve and Annunciation” and others), but finally it turns out that he is still pursuing the canon in the fundamental approach and the images become captured in the spirit of humble veneration and devout interpretation of their essence and predetermination. Tikhomirov’s works of “Okonopis” are intimate and monumental at the same time. The size corresponds to an ordinary window shutter of a village house (izba), and the works are naturally adequate to human Eye and Heart. 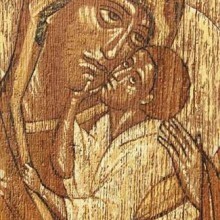 It could serve both as frescos in a church and as icons. The Artist manages to perform his works suitable for two types of surroundings — monumental and chamber. They combine affection, lyricality and high spirituality rendered in ascetic images and rigorous holy faces. “Festival of the Savior”, “John the Forerunner”, “Saint Nicholas” unite and complement both icon and fresco. Not only artistic but also individual space and time of this artist seem compressed as if he feels an urge to accomplish a lot. The attempt to express the eternal quest of the perishable to the Eternal, the Confusion to the peace is binding and disciplinary for the artist. This is the reason why there is no vanity in hard work of A. Tikhomirov. Color palette employed by the artist is well considered and refined. Nothing is superfluous, nothing is subjective. The artist has deeply studied and creatively conceived the canonical requirements, which dictate the strict selection of the employed means. Some images are more monumental (despite small sizes) like “Heavenly Savior” (46×27), others convey intimacy which is a peculiar feature of religious icons for churches in traditional icon-painting school, the example is “John the Baptist” (65×39.5). Polyvariancy, merging of movement and rest, rendering dynamics through statics, manifestation from non-existence, highlighted lightbearing and blessing of forthcoming Message are reproduced by the artists using composition and color. He effectively uses the traditional plot in one of his best works “Annunciation Eve. 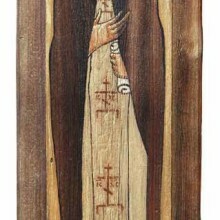 Annunciation” (54×53,1998). As if transfigured, the image of Mary (to the right) comes to life and is shining with the sign of God’s Grace (the Virgin Mary wears skyblue azure apparel); Mary to the left is robed in dark-cherry color peculiar of Our Lady. The flow of graceful divine energy is neatly revealed by the artist in the natural wood material — through its ring structure. Here is the miracle of vision manifested by the artist’s Eye and skilled hand. The painting’s color is extremely laconic, graphics is flawless, which results in an unusual effect. Here is A. Tikhomirov’s manner of “writing” on wood, master’s handwriting refined to the calligraphic precision, clearness and perfection. Next to it there is an absolutely different image character and a mood variation of the same plot. It has been performed in different colors and a different manner. All “characters” are united: Our Lady is wearing skyblue and violet apparel; she is both the Virgin and Our Lady (Mother of Christ), her holy face is deeply humble and silent, respectfully bowed in front of Gabriel the Archangel, who has brought the Message from above: she is ready to fulfill His will. There is no arrogance and hypocrisy, pretension and aestheticism, playing with great theme in A. Tikhomirov’s works. They are sincere, calm and self-sufficient, they do not attract shallow market interest, there is no detail “for sale” in these works. At the same time, the artist’s works are of great interest for both connoisseurs of art and art lovers, as well as for those who would like to enrich their collections not with short-term popular works, but with works of art worth of attention and admiration.